Weddings can be expensive, so how can you keep the cost down? These days more and more brides are choosing a DIY wedding, making everything from place cards to their bridal bouquets. While for some, the idea of homemade decorations gives them chills, it’s a great way to save some money and can be fun too! Below are some suggestions of ways to create a DIY wedding and some tips in the run up to the big day. From homemade sugared almonds to individual pots of jam, there are loads of ways you can create cheap and easy favours for your guests. 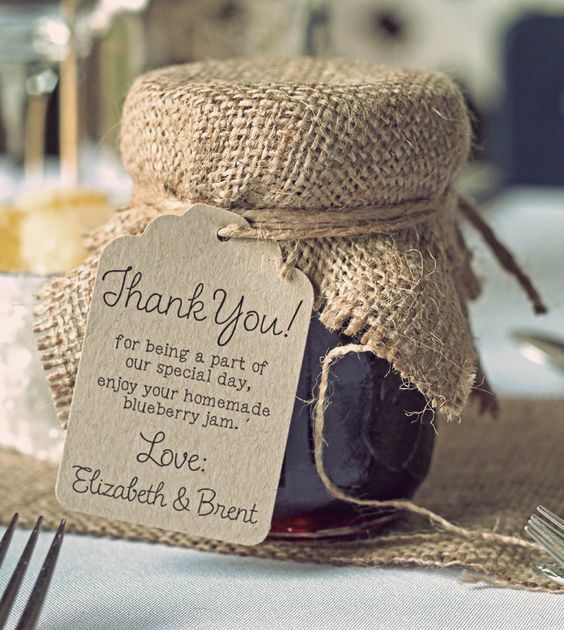 Add a luggage tag to your pot of jam and it can even double up as a place card. Decorate wooden pegs and pin them to peoples glasses or use pebbles and write names on them. If your venue doesn’t supply glass and tableware, consider borrowing it from a large supermarket – many will loan their glasses for free, you just have to pay for any that are broken. A cheap and easy way to decorate a room. It doesn’t need to look like a children’s party, but a few balloons clustered on the tables can add colour and height as a centrepiece without spending a lot of money. These can account for a large part of your decor budget, but you can reduce the amount you spend. 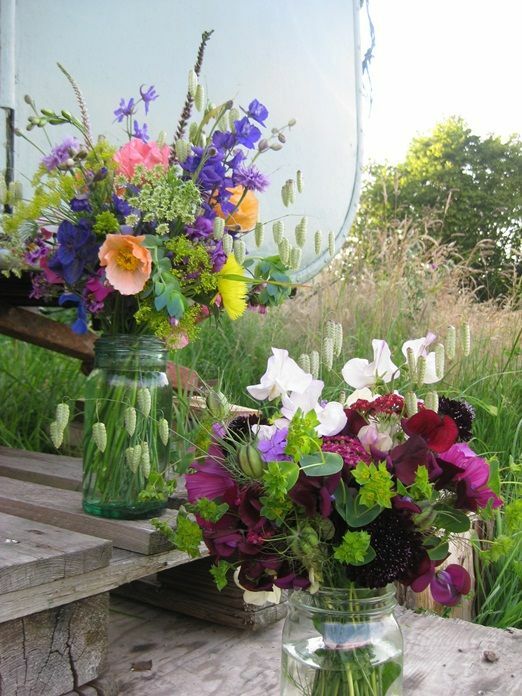 Homegrown flowers in pots or seasonal flowers can add colour and charm. Decorate your pots yourself or collect vessels from car boot sales for a vintage feel. 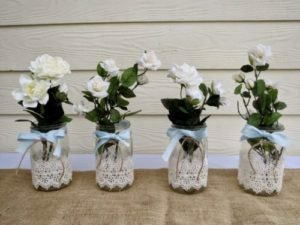 Save your jam jars and cover them with hessian or lace or why not spray paint tin cans or glass vases to add pops of colour and interest and ensure they completely match your theme! Don’t be afraid to use fake flowers instead of real ones. Nowadays there are some fantastic fake flowers available. Since you can buy these in advance, you can also spread the cost over a few months. Or make paper flowers, they take a bit of practise but can produce beautiful results. Pillar candles and ivy can create a simple, but elegant look and minimise the need for lots of other flowers, creating a less is more approach. A great way to highlight an area where you want to make an impact or just to create that magical feel for an evening reception – just don’t leave it to the day to check they work! Use tulle (a kind of net curtain type material) a cheap and easy way to cover up problem areas, for example those boring notice boards in the village hall. Great to cover up ugly areas (toilets) or to create an alternative guest book. Simply spray silver or white (or your theme colour) and cement into a large pot. They look great with fairy lights and if you place them in front of a mirror or window, you get double the twinkly effect! 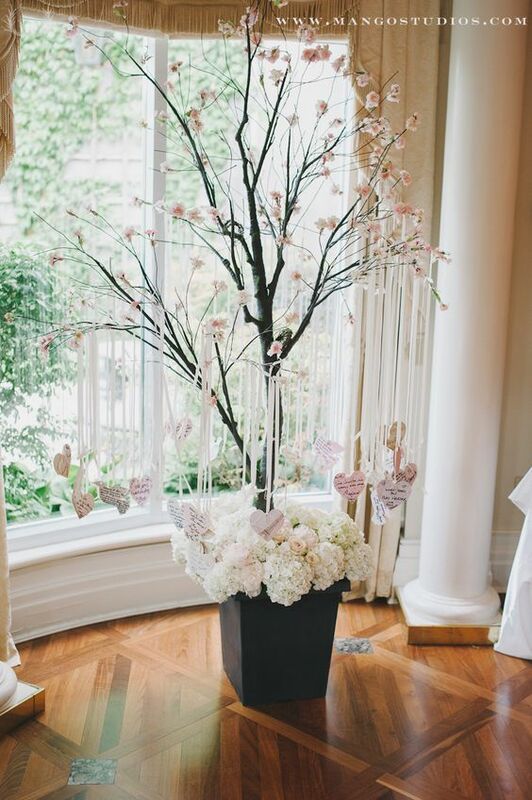 Collect lengths of ribbon and lace in your colour scheme and suspend to create a beautiful backdrop for photos. Collect props (think hats, fake moustaches, silly signs) in the run up to the day and then hang a large frame somewhere to create your photobooth. You’ll need to set up a camera to take the photos or perhaps position a video camera to capture all those silly poses. Wait, this is supposed to be a money saving blog! There are lots of wedding forums out there where past brides are selling on their decor. Take some time to hunt around and you might find everything you need for a fraction of the price of buying it new. This may seem obvious, but there is no point creating rustic log slice centrepieces if they won’t fit with your theme! Don’t be afraid to visit your venue a couple of times to check the ideas you have will work. Look at which areas will make the most impact to decide where your decor should go, but don’t forget to think about problem areas that might need covering up e.g. access to the toilets. Set yourself a budget and stick to it. It’s all too easy to let your ideas run away with you and before long what started out as a cost saving exercise has spiraled and you’re spending too much. Pinterest can be your best friend for helping you decide on the theme and styles of decor you want. For actually finding it, visit car boot sales, raid your gran’s attic, trawl the charity shops and don’t forget all the bargain basement stores, many of whom are selling wedding decor now too. Once you’ve decided your theme and what decor you want, get cracking! While making your own decor can save you a lot of money and also be a lot of fun, it can also be very time consuming. If you go for diamante encrusted centrepieces, just remember it will take a long time to individually stick each diamante! Also you may not find everything you need straight away so it’s best to start making or at the very least planning what you will need as soon as possible, that way you have time to find the bargains too. The most important thing first is to identify who is going to help you! Decorating a venue is not a one man job, even more so if you only have access on the day of your wedding. It takes a lot longer than you think to put chair covers on, get centrepieces just right, set your placecards and flowers. Try and stage a table before the big day e.g. at home. Get your decor exactly how you want it and then take photos to help you (and your helpers) remember where everything should go. Find out what time you can get access to your venue, is the day before, or the day itself? If your venue is supplying tablecloths, cutlery, tableware etc ensure they will have set this up before you arrive to dress your venue. Create a box for each table and put the relevant decor into it with your table photo on top, that way your helpers know exactly what should be on each table. If you think you might struggle for time or just not have enough extra help, consider getting a venue dresser in to help you. While staff at your venue may be able to help you, they won’t have time to spend several hours setting things out for you. Wild Wedding Company can dress your venue using your decor, or our own, leaving you free to relax before the big event. Once you’ve had your wedding day, if you can bear to part with any of your decor, why not sell it on a wedding site and maybe make some of your money back. Does all this seem like too much hard work or you just don’t have the time, consider hiring your decor. Wild Wedding Company have a range of items to hire at affordable prices meaning you don’t have to make or source them yourself, nor do you have to try and sell them on again afterwards. We can also create bespoke decor just for you. Why not contact us to find out how we could help.